How does one quantify peace? How does one quantify peace? What credible databases concerning conflicts, safety, military, or crime statistics should one throw into the mix to construct the “formula for peace”? How do countries get compared and ranked? 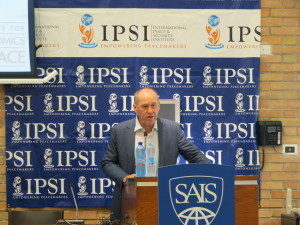 Steve Killelea, the founder and Executive Chairman of the Institute for Economics and Peace among many other things, accepted the tremendous challenge of answering those questions head on by creating the Global Peace Index (GPI), an attempt to define peace and rank the worlds’ nations’ and regions’ peacefulness. 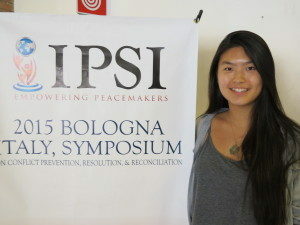 When he came to address the IPSI Bologna Symposium last Thursday, however, I found myself being left with more questions than I began with and reconsidering the concept of peace. What’s the functionality of a ranking on peacefulness? Is it fair to reduce an entire country consisting of many vastly different regions with different political and social realities into a single peace index? Is it fair to move countries down the rank for the escalation of violence triggered by grassroots social uprising just as much as that by genocidal killings? Killelea’s lecture was incredibly informative. The GPI measures peace through a combination of ongoing conflict, societal safety, and militarization. Each category is measured by using data such as deaths from organized conflicts, number of displaced people, homicides, jailed population, and armed service personnel, etc. Having produced the index for the past eight year, IEP analyzes the massive amount of data to produce trends that sheds light on characteristics of the most peaceful countries as well as the economic consequences of conflicts. IEP started the crucial process of making transparent what constitutes a peaceful state. The mere absence of physical conflicts between ethnic, religious, and political groups is only a small part according to the methodology of the GPI. The ability of states to avoid general suffering directly resulted from displacement of populations, incarceration of criminals, and militarization of police forces and armies is equally significant in the equation. Even the accessibility of weapons is a visible yardstick. The breadth and depth of IEP’s definition of peace serves as a reminder for countries on all points of the peacefulness spectrum to focus not just on avoiding visible conflicts and subsequent deaths and injuries, but also on maintaining or improving the sense of security and stability within the society. Besides the value of the definition, however, I am skeptical of the ranking mechanism. I assume the GPI serves mainly an educated audience, both individuals and organizations, who consults the index to estimate and evaluate risks for visiting, doing business, or running operations in the concerned regions. These individuals and organizations will inevitably think twice about their plans when the country they plan on going to ranks in the bottom five percentile out of more than a hundred and sixty countries. Doesn’t the ranking then, in a way, reinforce the aggravation of negative media coverage? Doesn’t it further drive investors, business people, and non-profits away from participating in the economy, civil society, and diplomacy of these countries and, by doing exactly that, holding them accountable for their actions and shielding potential threats from their citizens? I flew straight from Pakistan, where I spent the last month working on visual narrative storytelling about government accountability and anti-corruption, to Bologna for this symposium. Thus, the utter absence of imminent danger and organized conflicts I experienced during my stay in Pakistan serves as the most recent reminder that, sure, countries like Pakistan are in no way peaceful due to a dysfunctional and largely corrupt government, a barely controlled terrorist organization floating in the rural area, and vast social inequality, but they do possess a reasonable amount of prosperity, livelihood, and urban safety in the majority of areas and communities. Ranking the entire country of Pakistan as the 154th out of 162 countries in peacefulness is a similar practice to portraying only terrorist attacks and religious extremism there in the media. It risks reducing the societies to one single story and eliminating potential opportunities, given the already vast influence the GPI has. I’m curious to see whether my stance on such ranking mechanisms would change as the symposium develops and my knowledge broadens.